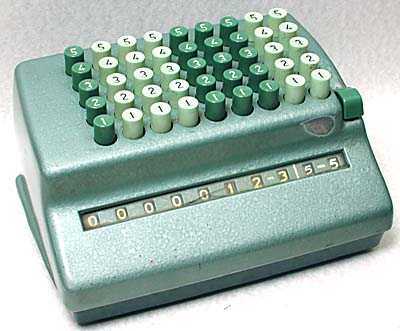 Plus model 509/T Time "Comptometer". It is a model 506/T where the 5 denotes the abbreviated keyboard (keys up to 5), the 09 denotes the 9 columns of keys, and the T denotes a Time (hours and minutes) version. The machine illustrated has serial number 509/T/828599, and has the angular style casing which was introduced in 1958. The keyboard of this machine has keys with, from the left, 7 columns of Hours keys, and 2 columns of Minutes keys. Although from the outside the machine is similar to a normal decimal machine, inside it is geared to carry over when the second column from the right reaches 6, i.e. 60 minutes carries over to 1 hour. To enter a number above 5 the operator has to press two keys in that column, one after the other, which add up to the number required. The machine in the photographs above and below displays the total of 123 Hours and 55 minutes. By adding 5 minutes (i.e. pressing the 5 key in the right hand column) would produce the result 124 hours 00 mins. This machine would have been very useful in the wages department of a company, totalling the hours worked. Time has not been metricated, so there is still the need to calculate in hours and minutes. Electronic calculators are available for the television industry which can calculate in hours, minutes, seconds, and frames for various broadcast standards.